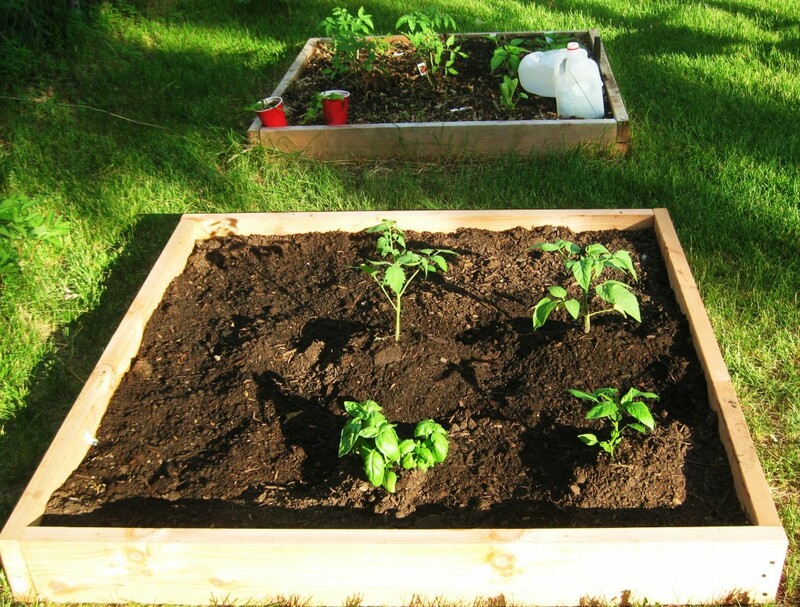 Raised Bed Gardens – Why Start One? Over the years when I drove by a home that had a raised bed garden, I often wondered why bother? 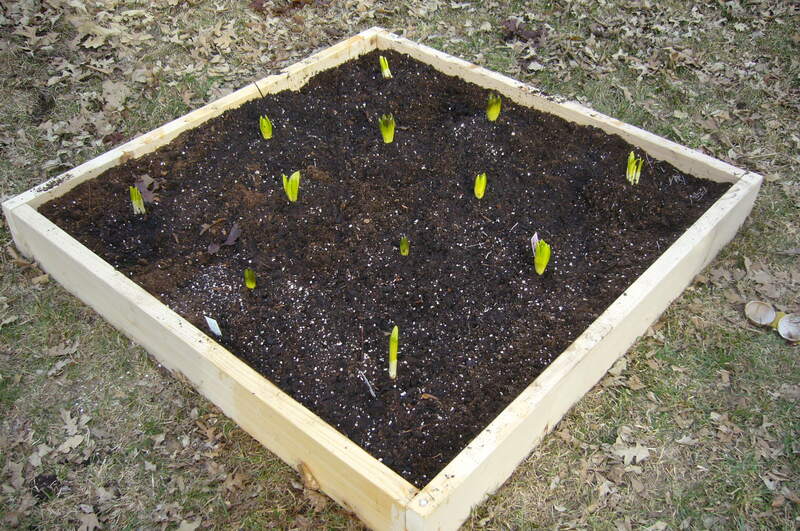 Why didn’t they just till up the ground and plant their vegetables in the earth like humans have been doing for ever? I’m sure the Garden of Eden was not a raised bed garden! During all of the years that my family was growing (my baby is 20!!! ), I planted, tended, and harvested large amounts of vegetables from my massive garden plot -100′ x 50′ at one point. It produced an abundant supply of potatoes, carrots, tomatoes, beans, cukes, sweet corn, popcorn, radishes, peas (though they were often eaten before they made it to the table), green beans, kohlrabi, squash . . . you get the idea. We ate fresh produce from the family garden all summer long, and during winter months, enjoyed preserved vegetables and fruits that were frozen and canned in the fall of the previous summer. As the kids grew and my work responsibilities became more time consuming, the size of the vegetable garden shrank to a more manageable 50′ x 40′ area and I created a water garden including a pond with a waterfall in the area that was reclaimed. Tending both gardens was often my therapy. My eldest brother once commented on how beautiful my gardens were and I told him it was my therapy. He promptly replied, “You must need a lot of therapy!” At that time my kids were fully grown and venturing out on their own and I was recently divorced and needed a way to keep myself occupied that didn’t cost a lot of money. Gardening for me, has always been a way to forget my troubles. Moving yards of mulch one wheelbarrow at a time and hoeing, weeding and cleaning out the pond are as dirty a job as anything I’ve done, including cleaning out the dairy barn on the farm I grew up on. But it is so satisfying and rewarding to be able to reap the rewards of the hard labor and aching muscles after a day in the gardens. And I sleep so much better than after a stressful day of managing computer networks and user requests. we can locate them in the area that receives the most sun without disturbing the ground and tree roots. I wasn’t sure how I was going to like having to garden within the confines of a 4’x4′ wood structure. Turns out I love it! 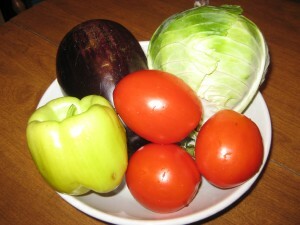 They are so easy to prepare, plant, weed (it takes second – truly), and the produce is delicious. It is truly amazing how much is produced from one bed. I follow Mel Bartholomew’s method the All New Square Foot Gardening: Grow More in Less Space which describes in details how to get started. I loaned the book to my neighbor so she could learn about the method, and we installed a 4’x4′ garden in her backyard two weeks ago. 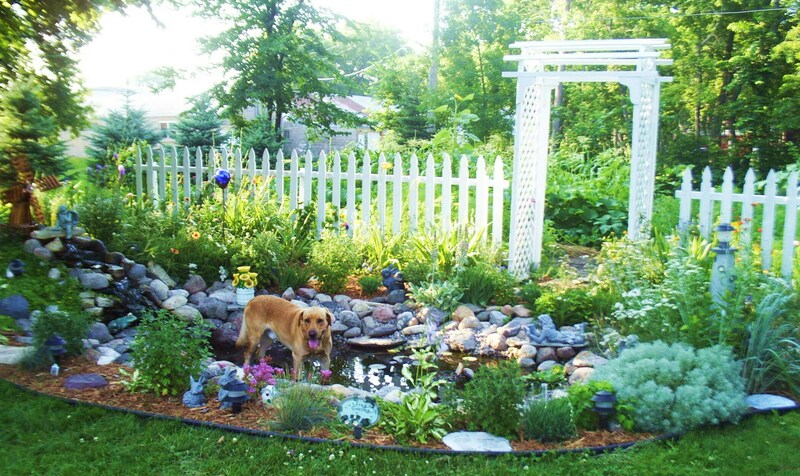 The true beauty of the raised bed gardens is that it frees up my time so that I can give more attention to the water garden and perennial gardens, which I enjoy even more than the vegetable gardening. Author AdministratorPosted on June 5, 2010 June 5, 2010 Categories Raised Bed Garden, Square Foot GardensTags raised bed gardens, Raised Garden Bed, square foot gardening5 Comments on Raised Bed Gardens – Why Start One? Planting a raised bed garden is easy and can be done without tilling. 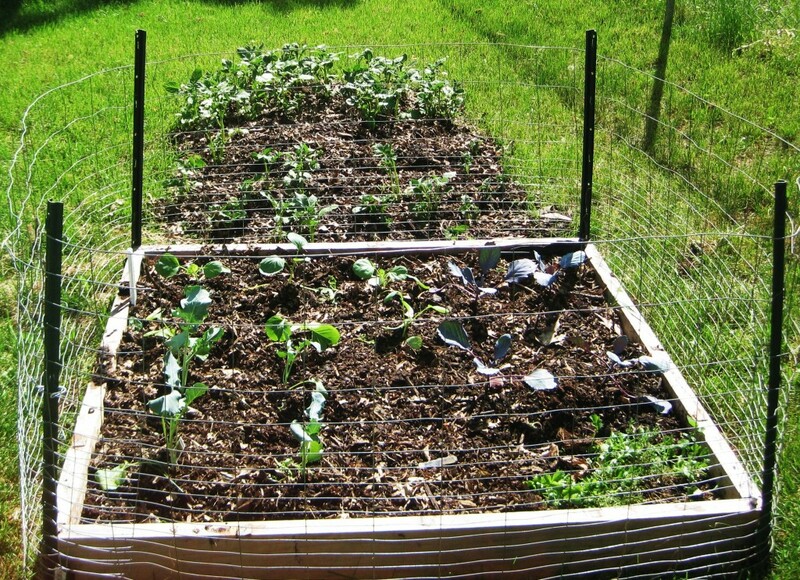 This raised garden bed has broccoli, cabbage, green beans, cilantro, and thyme planted. Normally I do not plant my vegetable sets in the garden until Memorial Day Weekend or later, but given the fact that it was 95 degrees (and the humidity level was about the same) yesterday, I decided to break my rule of thumb and plant the gardens. Last year I installed two 4’x4′ square foot gardens in Steve’s backyard. Now you should know that I have a 30′ x 50′ plot of garden space in my own backyard at my house, but since I spend very little time there since Steve’s stroke, it has pretty much become a weed patch. Anyway, I absolutely love the raised bed gardens. The reasons are many. Not the least of which is that there is virtually no weeding to be done. 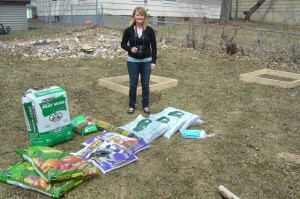 You prepare the soil which is a mix of compost, vermiculite or perlite, and peat moss. Plop the seedlings or seeds in sections (I don’t adhere strictly to the square foot method, but it ends up being pretty close), water well, and pretty much just watch it grow. I do install a “rabbit-proof” (in quotes because I’m not sure there is such a thing but this works pretty well) wire fence around the perimeter of the raised garden beds just in case they decide to mow my garden for me. I must say that the fence worked really well last year. I didn’t have any rabbits in the garden until the fall after everything had been harvested. By that time the fencing had come loose enough at the base that they could crawl under. Tent stakes work well to keep the fence adhered to the ground. If you plan to use fencing, don’t bother with the green plastic stuff. I’m not sure why they even bother manufacturing that unless it’s to keep baby chicks in. Two years ago Steve and I spent an afternoon installing plastic green fencing around my garden at my house and the next day there were holes chewed in several places – just large enough for the rabbits to get through. I was ready to start shooting the little critters – which would surely have had the local police and PETA members over within minutes since my house is in the center of downtown. That was before I knew about the used kitty litter trick and the rabbits pretty much destroyed a good portion of my garden that year. So back to why I love my raised bed gardens. 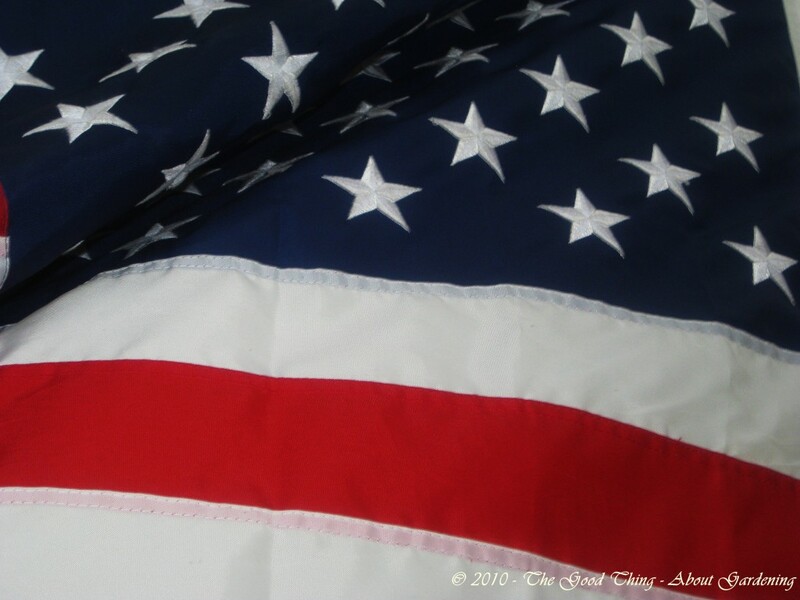 They’re easy to plant, water, weed, keep critters out, and harvest. You can also make little greenhouses out of them in the spring by making a canopy of flexible PVC tubing and plastic sheeting. Cleanup is a breeze in the fall and spring prep is simple too. All I did to prepare them before planting was add more compost from my compost pile, some more peat moss and mixed it well and that was it. Because the soil is very loose, it drains quickly so I water every evening unless it rains during the day. The harvest of produce from these two little beds last year was amazing. From one 4’x4′ square, we picked 4 heads of broccoli, about 10 eggplants, 8 heads of cabbage and 20 onions. After the broccoli was harvested, I added 5 hosta plants in that space and overwintered them there. And that was just one bed! I grew tomatoes, lettuce, spinach, lavender, thyme, dill, green beans, peas, basil, and cilantro in the other bed. 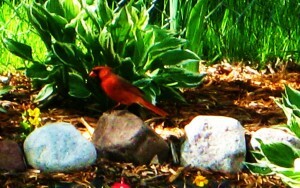 Male cardinal stops by for a sip from the backyard pond. 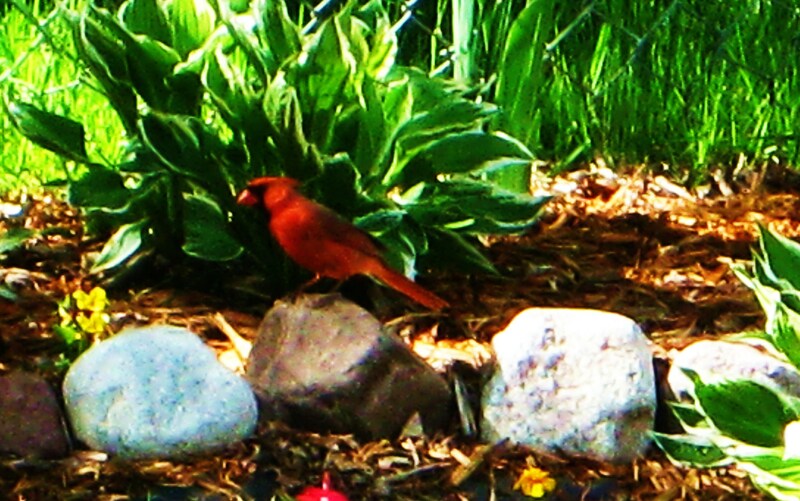 After the planting was done, Steve and I relaxed in the shade by the backyard pond and enjoyed a visit from a male cardinal who stopped by for a sip of water. It’s such a good feeling to finish the spring planting, and it took less than an hour this year! Tomatoes can be started from seed (be sure to choose an organic or heirloom variety) or plants can be purchased from local nurseries that specialize in organic gardening. In order to produce an abundant crop, tomato plants should be planted in soil that consists of a rich organic mix of composted material and is well drained. 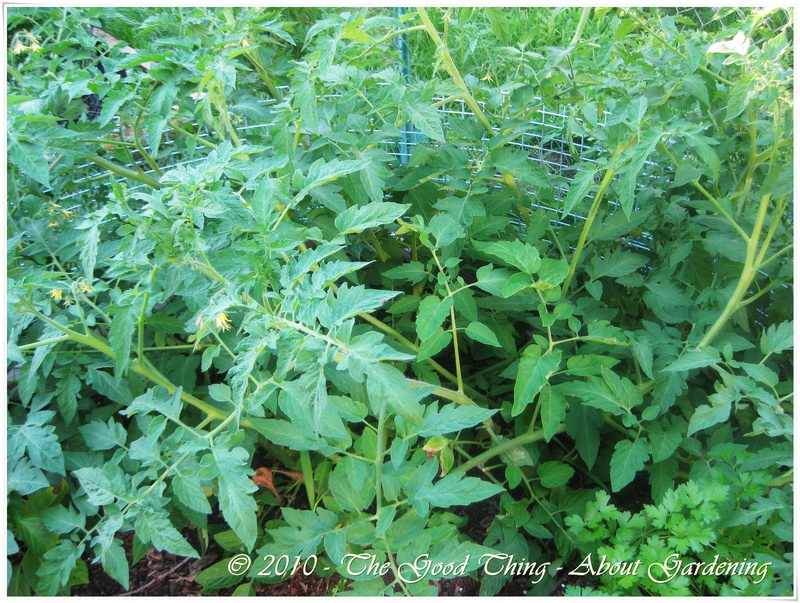 Tomato plants require plenty of sun (at least 5 hours per day). Plants should be watered well at the base of plant to keep moisture off of the leaves which can contribute to late blight. Plants should be set out well after the danger of frost and when soil temperatures are above 50 degrees F. Plant the roots deep, firmly packing soil up to the bottom of the first leaf of the plant. You may want to protect the plants by placing empty gallon size milk jugs with the bottom removed over the plant until it is well established. 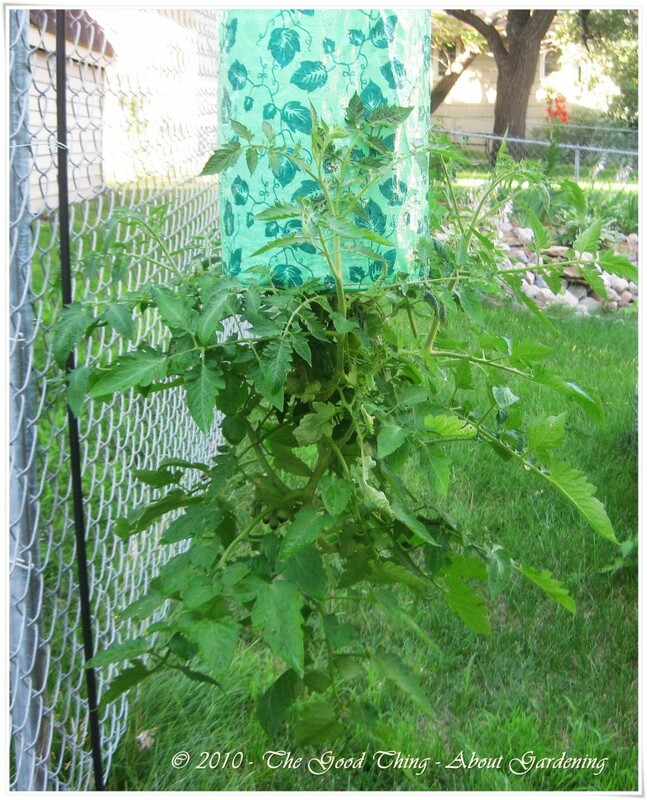 As plants mature, they require support to keep the tomatoes off the ground. Tomato cages or stakes can be used for this purpose. Plant Borage as a companion plant near tomatoes to prevent pests from eating leaves and harming or infecting other vegetables such as eggplant, peppers, and potatoes. Worms and eggs can be removed by hand from the leaves and stems of the plants. Insecticidal soaps can be applied and are an effective method to rid plants of aphids and other harmful insects. Many gardeners release lady bugs in their garden, which are a predator to aphids. Soil may be lacking calcium. Spray with seaweed extract and keep moisture content of the soil even by covering with a layer of mulch. Row covers can be used to protect plants from cool weather temps. Keeping the soil built up with compost, dried blood, or fish emulsion will prevent diseases that are due to lack of nitrogen or phosphorus. 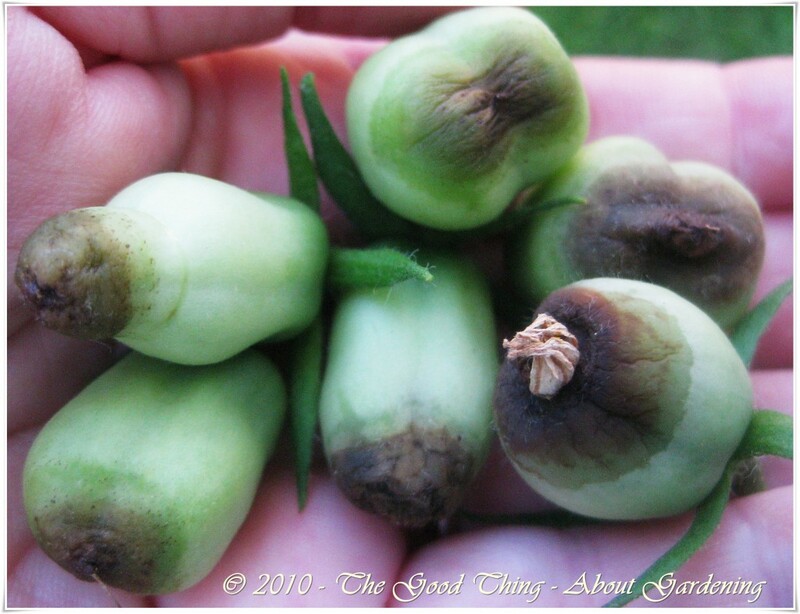 If plants have grown tall and spindly and are producing very little fruit, pinch off the suckers (growth between the stems). If they have plenty of blossoms, but are not producing, they have not have been pollinated. Use a Q-tip to brush pollen from one blossom onto the others. 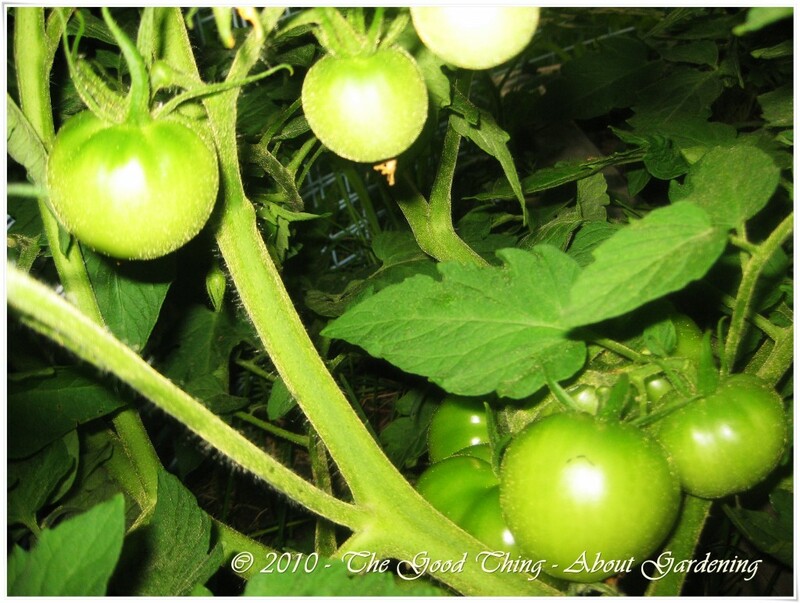 Planting a variety of organic tomato plants will produce an abundance of tomatoes throughout the growing season. 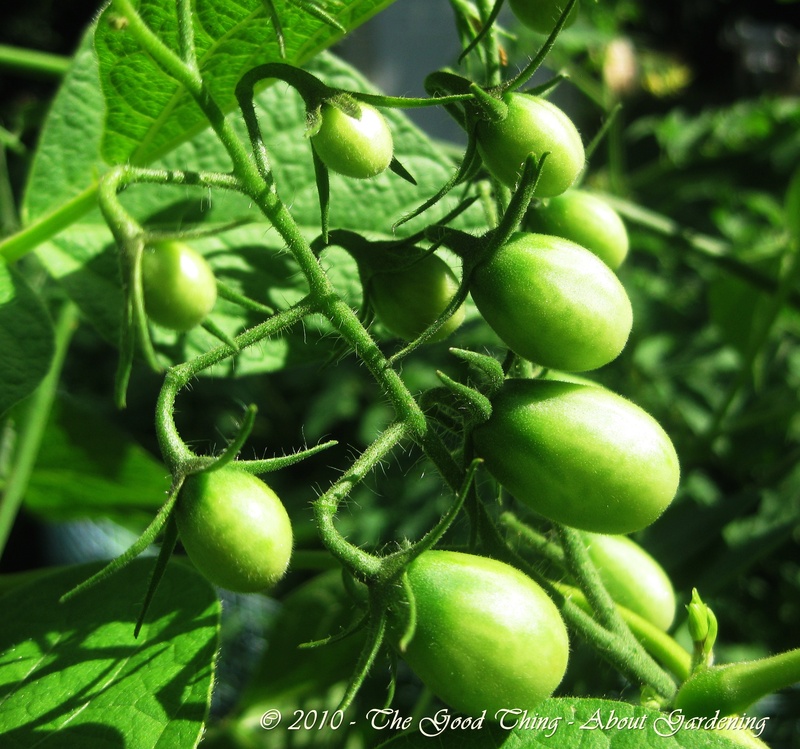 Following these tips will allow for a harvest of healthy, wonderfully delicious tomatoes that the whole family can enjoy in salsas, sauces, or fresh from the vine. Seeds from this year’s crop can be saved to plant next season for another year of plump juicy tomatoes. Growing strawberries in your backyard garden is a very rewarding experience, and is a fun and healthy activity for the whole family. Enjoying a handful of plump, juicy strawberries grown in your very own backyard is a real treat. Growing strawberries takes a little more care than some other popular fruits such as rhubarb and tomatoes, but with a few tips, even the beginning gardener can be successful at it. 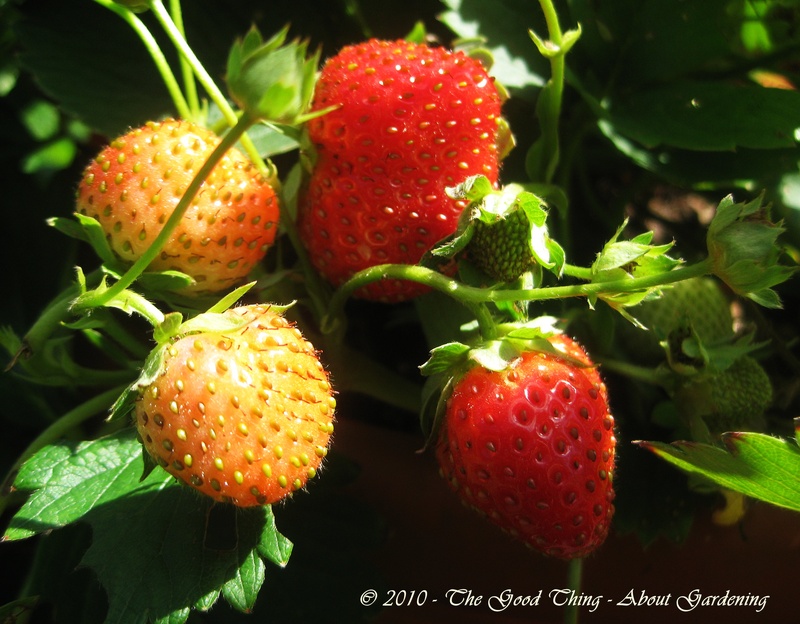 There are three basic types of strawberry plants that can be grown in northern gardens. June-bearing produce a large crop in late spring; ever-bearing produce one crop in late spring and one in early fall; and day-neutral strawberry plants produce fruit throughout the season, however the overall production is generally less than the June-bearing variety. You should work with your local nursery to choose a cultivar that is appropriate for your area, or check the USDA gardening zone and order plants online. Strawberry plants thrive in an area that receives 8 or more hours of full sun per day. Less sun and the plants will still produce berries, however there won’t be as many, nor will they be as large. The soil should be well-drained and free from soil-borne diseases so you’ll want to choose an area that was not recently used to grow tomatoes, eggplant, potatoes, or peppers. Soil should be slightly acidic (pH between 5-6). A raised bed garden is a great choice for growing strawberries, as it provides proper drainage and the soil can be amended as needed. When planting strawberries in a raised bed garden, you can use the hill method, rather than the matted, or space matted system. When using the hill method, trim off the runners from each plant and space them in rows 12″ apart. If using the matted or space matted system, plant them in rows 3 feet apart, spacing each plant 12″ from the next. The matted system requires no trimming of runners. However the space matted system requires that you trim the majority of the runners and affix them so that they are spaced 12″ apart from other plants. When planting, trim away any dead roots and plant in a hole deep enough to cover the root system, but leave the top half of the crown of the plant above the soil level. Water well and pack the soil tightly around the middle of the crown. The first year, blossoms should be removed from June-bearing plants to encourage growth of the root system and runners. This will produce a more abundant crop of berries the following year. 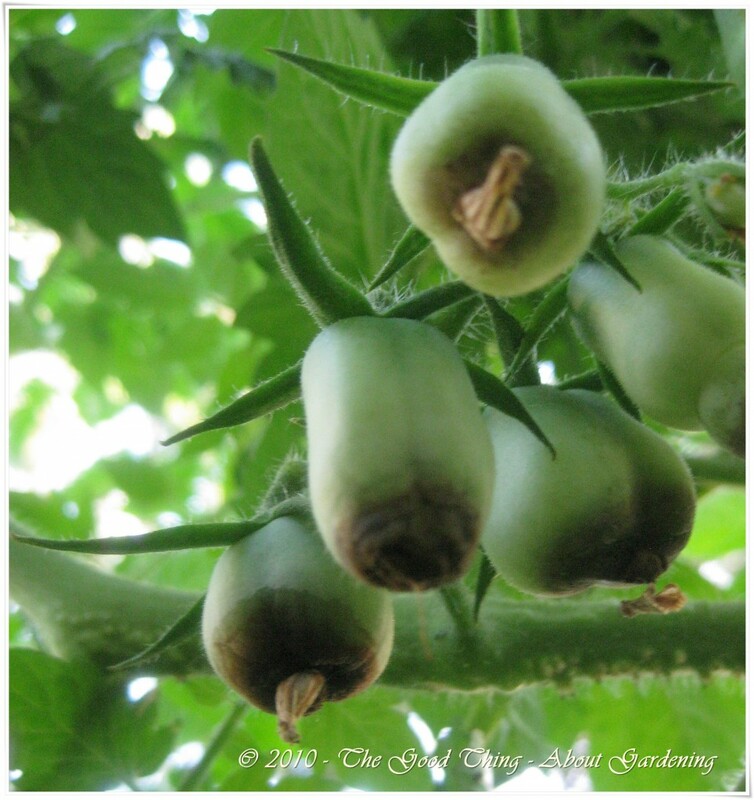 Ever-bearing and day-neutral plants should have their blossoms removed up until the end of June for fruit production in early to late fall. To encourage an abundance of fruit, strawberry plants need to be watered regularly, but should never sit in water. They should also be well fertilized. If you prefer an organic fertilizer, bone meal and blood meal work well and should be applied monthly throughout the growing season. A regular fertilizer of 10-10-10 at the beginning of the season is another option. 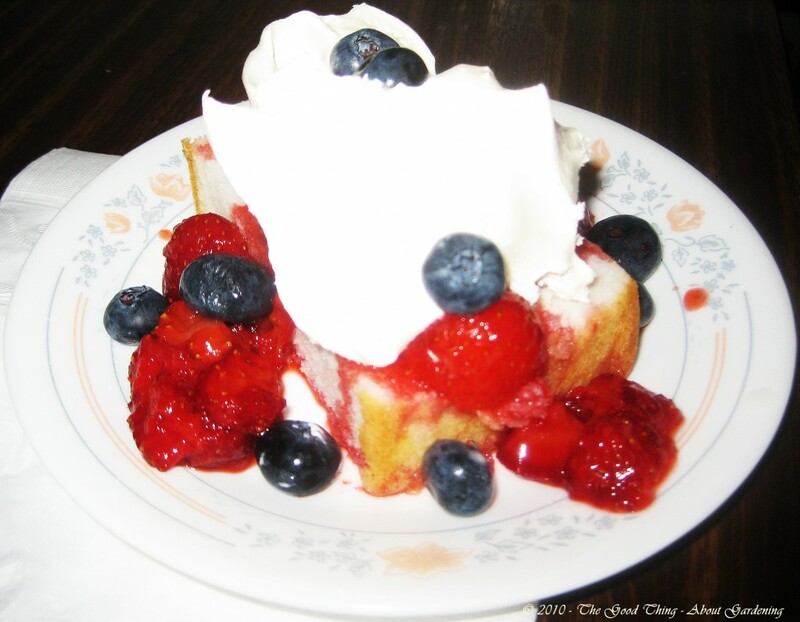 Strawberry plants are not prone to a lot of disease. However you may want to choose a variety that is certified to be resistant to Verticillium Wilt, since plants that are infected with this must be destroyed. To protect plants from birds, the strawberries can be covered with bird netting. If rabbits and deer are prevalent in your area, you may also want to install a wire mesh fence around the perimeter of your strawberry patch to keep them from nibbling (or completely destroying) the plants. At the end of the season, plants should be trimmed of dead foliage and plants should be thinned if runners were allowed to spread. Keep the strawberries well watered until the ground freezes and then cover with mulch to protect them during the winter months. If proper care is given, you may enjoy an abundance of fresh strawberries for 3-4 years before replacing the plants with fresh stock. 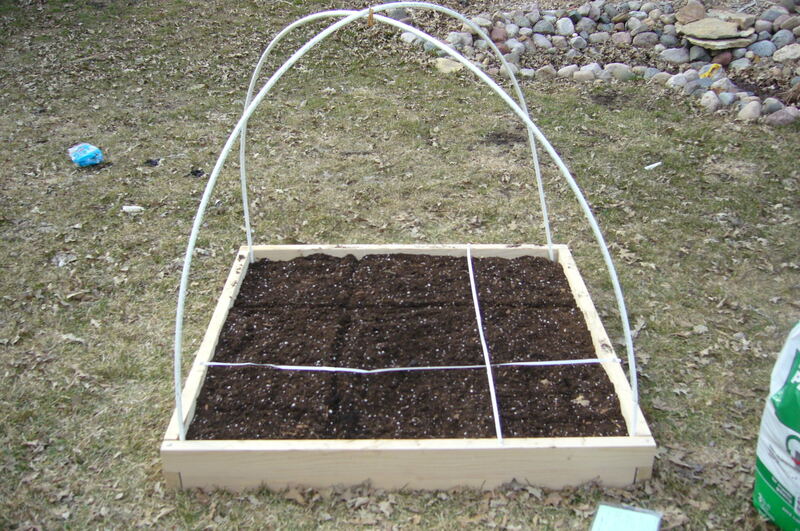 Organic compost, peat moss, vermiculite, weed cloth and the frame are already to be assembled. 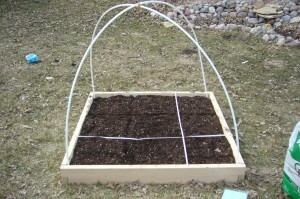 Build the frame and assemble items for soil mixture.A layer of weed cloth prevents weeds from growing up through the garden. 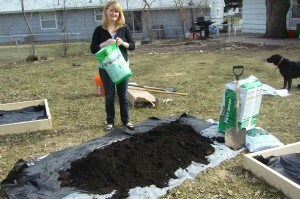 Use a large tarp to mix the compost, peat moss and vermiculite before adding to the bed. PVC tubing can be added to provide support for plastic sheeting in cooler weather. Add plants and watch them grow.